Immigration is a topic that America is very familiar with. It is ingrained in the history of our country and remains a heavily debated subject in politics, especially with the Presidential election coming up. Many Americans have a wide variety of views when it comes to how immigrants, both illegal and legal, and how they affect other Americans. Conflicting views are present on who should be allowed into our country and the policies they must follow once admitted. Many do not like the fact that immigration will take jobs from hard working American citizens, which is true. In 2014 17% of all workers in the civilian labor were immigrants, that’s nearly 26.7 million immigrant workers. Of the 25 Million employed immigrant workers 16 and over 30% worked in management or professional occupations, 17% worked in sales, while another 25% worked in service occupations. But average hourly rate for a Hispanic man in the U.S. is just $14 versus the $21 for a white man. The fact is that many immigrants are not only taking lower paying jobs but raising the wages for native workers. The Southern Economic Journal found that when there was an increase in undocumented workers the wages of documented increased as well. Hiring workers and filling jobs is as beneficial to a community as it is to the economy. A recent report from Lansing Michigan says that unauthorized immigration improved the area’s economy. That households led by immigrants collectively made an income of 19.6 Billion and paid 5.4 Billion in taxes. Some immigrants, like Americans, struggle to earn a comfortable living. Because of the lower wages some immigrants receive it is expected that those with families will live in poverty. In 2014, out of the 30.5 Million children in America living in poverty, 9.5 Million of those children had a least one immigrant parent. There are some families who come to America with nothing but the chance at opportunity. While unemployment is a concern for many native born Americans, the Unemployment Rate for foreign born workers in 2015 was 4.9%. This percentage came from a survey of 60,000 households from the National Bureau of Labor and Statistics. It includes legal immigrants, refugees and undocumented immigrants. The more people are looking for a job, immigrant or natural born citizen, the harder it becomes to find one. 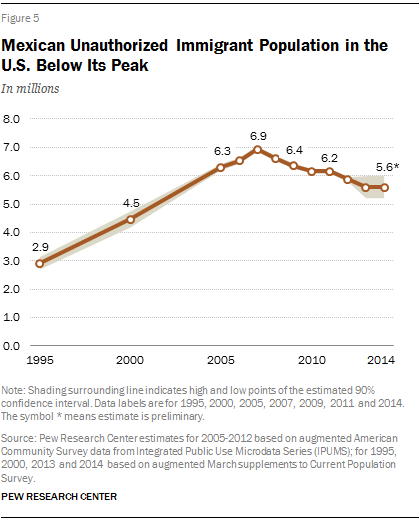 Many Americans see immigration as a problem that allows too many people into the U.S., but data does support that the population of undocumented immigrants has dropped under 11 million for the first time in a decade and has been stable for around 5 years. The number of unauthorized Mexican immigrants has also been in decline from 6.4 Million Mexicans in 2009 to 5.6 Million Mexicans in 2014. In fact only around 870k Mexicans have left for the US from 2009 to 2014, which is a huge decrease from the 2.9 Million Mexicans who left for the US from 1995 to 2000. If the benefit of birthright citizenship was revoked then it could decrease illegal immigration. If children born in America with immigrant parents were denied a natural citizenship it would negate the parent’s status of a ‘citizen’. Which could act as a deterrent for some families to remain in their country of origin. But even if it were enacted it may not change some of the views of immigrants coming to America. From 2009 to 2014 it is estimated that 1 Million Mexicans and their US born children left America to return to Mexico. In fact the leading country of origin for immigrants in 2014 was not Mexico but India with 147,500 arriving on US soil. There are a lot of unauthorized immigrants in America, but not all of them stay illegal aliens. 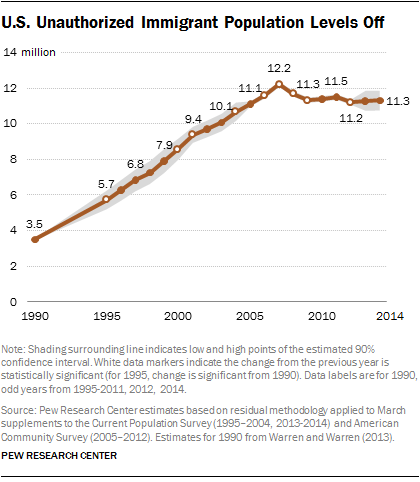 In 2014, 20 million immigrants, 43% of immigrant population, were natural American citizens. Of the 22.4 million immigrants who were not natural U.S. citizens only 11.3 were unauthorized. The remaining 11.1 were either lawful permanent residents of withheld temporary visas. Only about 27% of immigrants are unauthorized, while that percentage is still high it is far from a majority. There are many benefits for America and illegal immigrants earn citizenship. Immigrants who become citizens are eligible for more jobs and earn higher wages. An increase in wages would translate to an increase in spending on food, clothes and in some cases a house which would help the economy. Citizens are also required to pay local, state and federal taxes which would help generate more revenue for the community and the country. But many immigrants do not come to America alone, they bring their families in hope for a better life. In a 2014 report 17.5 million children 18 and younger in the United States had at least one immigrant parent. The conflict of immigration does not only effect singular people, but families. Many of those children are given better opportunities in United States, with 10.5 Million immigrants 25 and older have bachelor’s degrees. Those who are not educated have become so with 44% of those who entered the country since 2010 have become college educated. Immigrants who become citizens are granted the same rights and benefits for themselves but more importantly for their families. Which by itself is worth it on its own. Immigration is the past, present and future of America. It is something that the country was created on. But there is no arguing that adding to the population will have varying effects on the economy and communities. With both presidential nominees having such different views on how immigration reform should be implemented it is evident that change is apparent in the near future. We can only estimate the kind of impact new policies will have.